Shaolin Kempô Teacher Certificates of the E.N.S.K.B. and W.M.A.A. Walter Polzin was born on 15.12.1936 and he practises martial arts since 1950, he began with western boxing, wrestling, judo and later jiu Jitsu, shotokan karate. Since 1970 he does Shaolin Kempô and other styles under the leading of Sifu Tze. For many years Walter Polzin was national fighting coach and referee in different federations, he also was responsible for the curriculum of the black belt examinations and the training of the teachers for a long time. 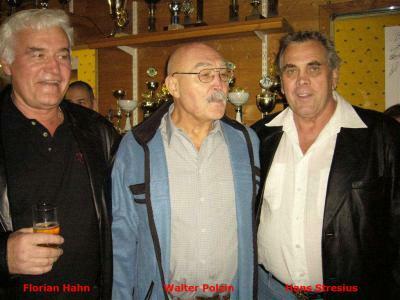 During this time Walter Polzin was coach and teacher in different shaolin kempo clubs in Duisburg and Wesel. Additional to these activities he trained very intensive for many decades with weapons (Wu Qi Tao Fa) and especially the family style of the Japanese Kobudo, Ohani Hockus Itto Ryu Bujutsu. He could learn this style because of his professional connections in his profession and within these because of a special personal relationship to a member of the Ohani clan. Today Walter Polzin just teaches a small handful of older students in his martial arts. 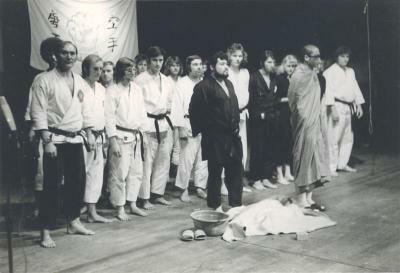 This picture was taken around 1974 showing my Sifu Walter Polzin 9 Dan Kempo ( far left,wearing the black trousers ),with the Founder and the roots of our Kempo Sifu Tze Dschero Khan Chen Tao Tze ( black Gi ) standing in the foreground. 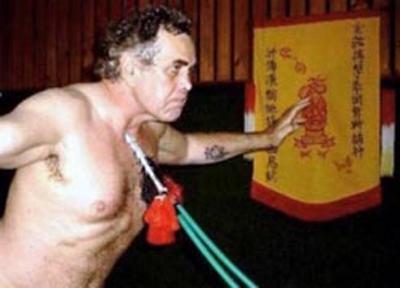 Dai Sifu Florian Hahn was born on 07.05.1947 in Krefeld, a german town near the dutch border. After some experiences in western boxing he began in 1968 as one of the first students of Hans Stresius with Shaolin Kempô. Later on as black belt he began to study direct under Sifu Tze in The Netherlands. 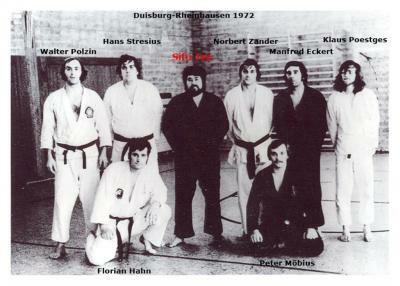 Together with his teacher Hans Stresius he founded the 1st Shaolin Kempo Club Krefeld in 1973. Since that time he is chairman and chief coach in this club. 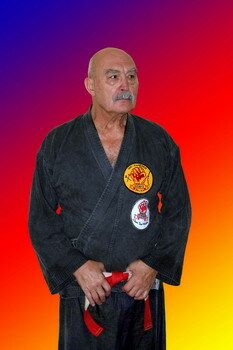 Florian Hahn had won some championships in traditional karate and modern kickboxing in the beginning 70s, and later on some of his students became very successful in kickboxing. The most famous student is Stefan Leko, the K1 – Fighter, who began his martial career up to brown belt in the club of Florian Hahn in Krefeld. Florian Hahn still practises martial arts today, especially Shaolin Kempô, Chuan Su Pok Kek Kune and Selfdefence in his club. Sometimes he is invited as a referent on martial arts seminars in Germany, The Netherlands and now Poland. Shaolin Kempô Teacher Certificates of the E.N.S.K.B. Hans Stresius was born on 12.06.1942 in Duisburg-Rheinhausen, a great german town in the Ruhr. From youth on he practises martial arts, he began with wrestling in the well know club AKS Rheinhausen and in his army time he began with judo under the leading of Hermann Scholz in Kleve, a little town right at the dutch border. In this time he graduated 1st dan in judo. Together with Hermann Scholz he first met Sifu Tze Dschero Khan Chen Tao Tze in 1962. At that time, Sifu Tze had his civil name Gerard Karel Meijers and he was teacher for military close combat in the dutch army. Under the leading of Sifu Tze Hans Stresius began together with Hermann Scholz first with Chuan Su Pok Kek Kune and later on with Shaolin Kempô and other styles. After Sifu Tze introduced on request of Hans Stresius and Hermann Scholz his martial arts in 1966 in Germany (on 27.07.1966 in Goch-Pfalzdorf), Hermann Scholz und Hans Stresius began to build up schools and club for shaolin kempo on the Rhineland and in the Ruhr. Hermann Scholz concentrated himself on the leading of his club "The Red Dragon" in Kleve, Germany's oldest kempo-club and Hans Stresius became an ambassadeur for Shaolin Kempo. He began to build up traininggroups, which were taken over step by step by his advanced students. Sadly some of these students had forgotten their origin. Beside that Hans Stresius was the man who organized nearly all the seminars Sifu Tze hold in Germany during the 60's and mid 70's. He worked hard with Sifu Tze and other blackbelts, especially Florian Hahn and Walter Polzin, to spread Shaolin Kempo in Germany, to structure it and to organize it in several federations and associations. Therefore you can name him the 'spiritus rector' of the german Shaolin Kempo, Sifu Tze graduated him with the 10th dan (10th Leong Toan). 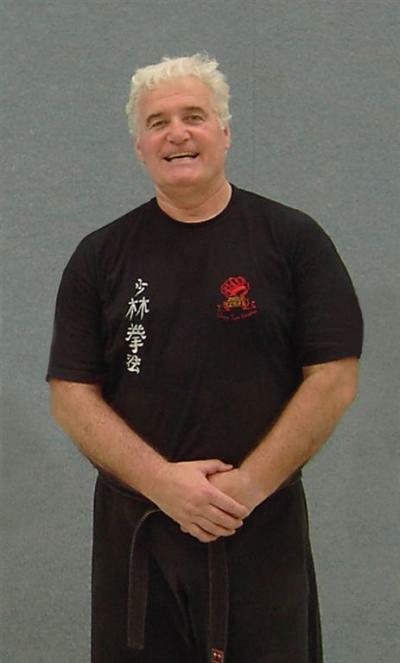 In the beginning 90's Hans Stresius retired nearly complete from the organized Shaolin Kempo in Germany and turned to build up and spread the Chuan Su Pok Kek Kune, the martial arts style, he learned first from Sifu. In opposite to the organized and through examination rules defined Shaolin Kempo you find in the Chuan Su Pok Kek Kune all elements of the chinese martial arts, including meditation, philosophy, traditional Chinese medicine, dragon- and liondance and drumming. Today Hans Stresius is the german head of the Chuan Su Pok Kek Kune and sometimes he teaches the 'old Shaolin Kempo' to friends and old students.